Thousands of ports can be open — 65,534 each for both TCP and UDP, to be exact. A continually updated listing of all well-known port numbers (ports 0–1023) and registered port numbers (ports 1024–49151), with their associated protocols and services, is located at www.iana.org/assignments/service-names-port-numbers/service-names-port-numbers.txt. You can also perform a port-number lookup at www.cotse.com/cgi-bin/port.cgi. If a service doesn’t respond on a TCP or UDP port, that doesn’t mean it’s not running. You may have to dig further to find out. Type the site’s name followed by a page that you know doesn’t exist, such as www.your_domain.com/1234.html. Many web servers return an error page showing detailed version information. Use Netcraft’s What’s that site running? 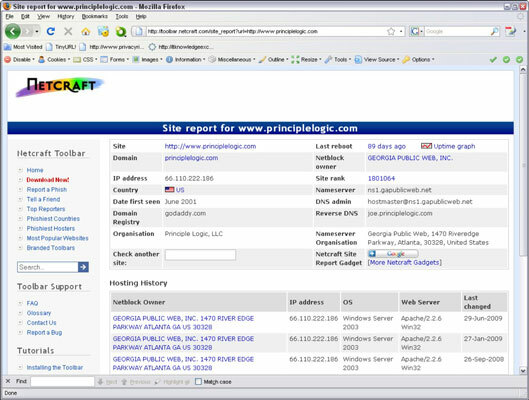 search utility, which connects to your server from the Internet and displays the web server version and operating system. NMapWin can determine the system OS version. An enumeration utility (such as DumpSec) can extract users, groups, and file and share permissions directly from Windows. Most e-mail servers return detailed information, such as the version and the current service pack installed. After you have this information, you (and the bad guys) can determine the vulnerabilities of the system. A share-finder tool, such as the one built in to GFI LanGuard, can find open Windows shares. An e-mail to an invalid address might return with detailed e-mail header information. A bounced message often discloses information that can be used against you, including internal IP addresses and software versions. On certain Windows systems, you can use this information to establish unauthenticated connections and sometimes even map drives.